Apparently, each capsule contains about 300 to 400 tiny brown seeds; 80,000 per plant! 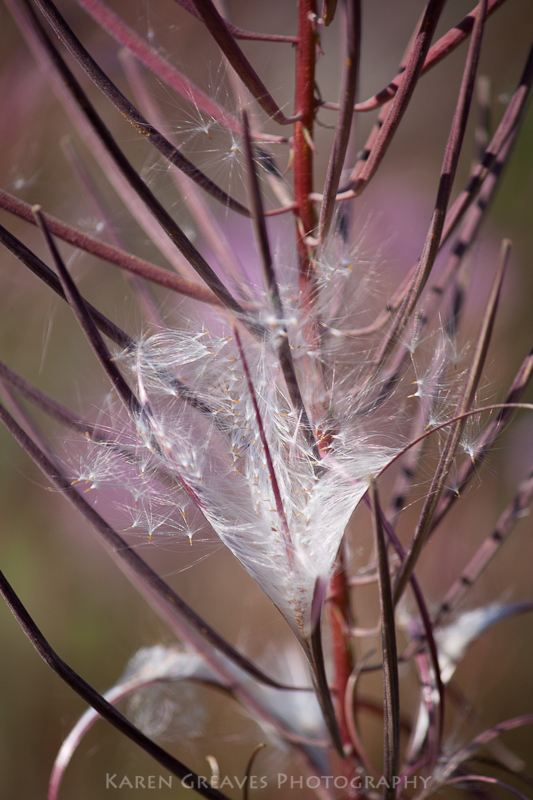 The seeds have long, silky hairs to catch the wind. I was so fortunate to find these plants at this stage on a calm, warm day. The heat of the earth combined with the disturbance Lindor caused moving through the brush ahead of me, created an updraft of air that propelled thousands of the seeds up from the plants. It was like watching snow fall in reverse! It was an incredible sight. I took a picture a couple years back of this puffy white fluffy thing that was kinda curled and fire pinkish red…I thought it was soooo cool and I didn’t have a clue what I was seeing through my lens 😉 beautiful pictures !! !